Mark: Comic book characters locked into perpetual monthly stories can never really change; someone like Batman is an archtype unto himself, and if you mess with that alchemy too much, you threaten to change what Batman is. I used to think of this limitation as a bug in serialized comic storytelling, that the lack of permanent change in a character somehow devalued the overall impact any specific authorial choices could have, but I’m beginning to see it as a huge advantage. If every new writer had to pick up directly where the previous arc ended, it would quickly become completely unwieldy. Long running TV shows encounter this problem all the time. I’m a big Gilmore Girls fan, but there’s no question that the last three seasons of that show (and the recent Netflix revival films) increasingly suffered from characters making nonsensical choices counter to what we know about them as the writers struggled to invent conflicts to keep the show going. Dividing comic book stories up into arcs, and having the option to press the reset button at the conclusion of each story, is a break-the-glass-in-emergency exit hardwired into comic books. Did you hate the way the last creative team handled Batman? Don’t worry, this new team is going to completely ignore it. But that doesn’t mean that comic book characters don’t change and evolve at all. Instead, each “version” of a character informs the next in subtle ways, sometimes pushing forward with an idea introduced in the past, sometimes working to reign it in. 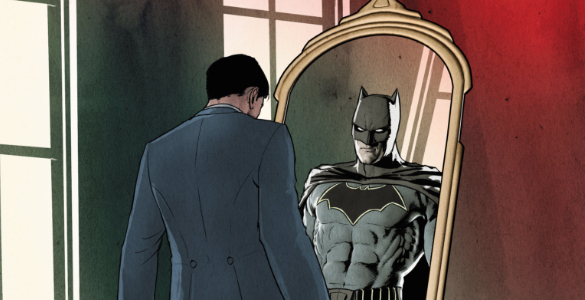 Tom King, Mikel Janin, and Joelle Jones’ Batman 44 is all about how past character moments can end up building to something monumental, and how, even when the comic book reset button is pressed, those monumental moments continue to inform the character. 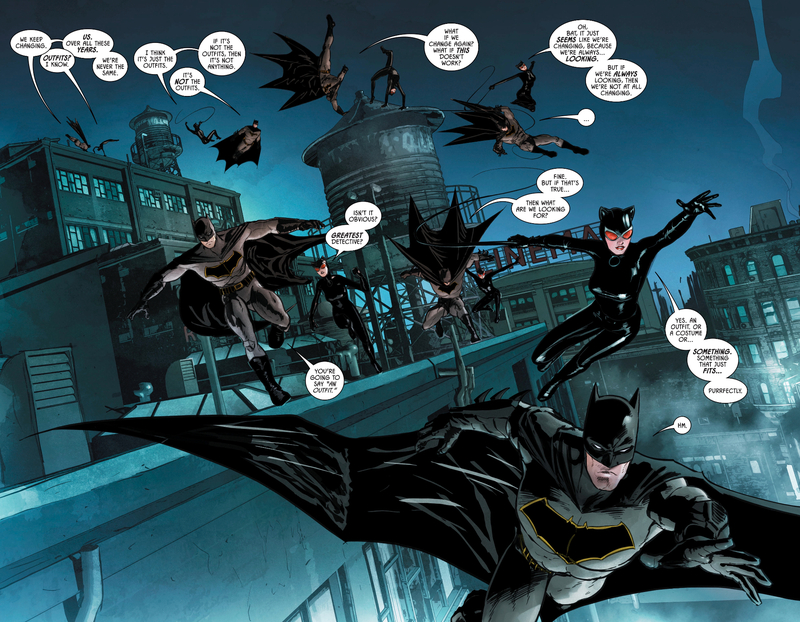 History is the crux of Batman 44, with alternating pages cutting between the present, where Selina sneaks out in the early morning to break into a high-end wedding dress store, and the past. Each page not taking place in the present seems to be honoring some milestone moment in the Batman/Catwoman relationship. It’s a neat way to illustrate how the choices of one group of creators can compound over time; in this case, Batman and Catwoman have had a romantic entanglement almost from the beginning, but they didn’t follow a linear path to marriage. It’s taken decades and decades of writers elaborating on that romance to lead to this moment. But Batman fans who are maybe not psyched about Batman and Catwoman getting married can take solace from the issue as well. Towards the end, in a bit of meta-commentary, Batman and Catwoman banter about the nature of their changes over the years. Catwoman keeps teasing Batman that any changes are merely cosmetic, but Batman senses that there’s something more. The truth, of course, is that these characters will always change, but the lasting changes will be incremental, not monumental. Sometime in the next few years Batman and Catwoman will no longer be married, maybe it’ll be retconned that they were ever married at all, and fans opposed to the marriage will have that thorn removed. But King also knows that even when his decision is undone, it will have forever affected the course of the characters. I have to admit that when reading the issue, I could tell it was referencing the past thanks to the throwback costumes, but couldn’t place the specific moments being recalled outside of the final one from Hush. A lack of Batman scholarship isn’t a barrier for entry (a quick Google search will bring up plenty of articles explaining the references), but King’s deep dive into Batman history seems like it would be particularly rewarding for those with a fondness for that sort of thing. What’d you think, Taylor? Does marriage feel like the natural endpoint for Bruce and Selina’s relationship? How do you feel about character moments persisting in comic books in general? Taylor: I’m not sure that marriage is the natural endpoint for these two, and there’s a couple reasons for that. First, and perhaps most obviously, Selena isn’t exactly the type of woman who seems like she would tie herself down. As she says in one of the flashbacks in this issue, she’s proud and independent, just like an actual cat (or in this case, a tiger). Of course marriage wouldn’t necessarily dampen any of Selena’s pride or independence and that’s where I think the first conflict in her marriage to Bruce could arise. It’s not only that Selena has a mind of her own, it’s that she’s proud and “independent” enough to believe that the normal rules of the world don’t apply to her. Batman stands in direct opposition to this viewpoint as he typically stands for the order and law of world. It seems unlikely that these two could stay together long when each hold such diametrically opposite views from the other. In this issue, we see that this difference in philosophy may already be rearing its head. Instead of going to try on wedding dresses during the day like a normal person, Selena decides to break into a bridal store in the wee hours of the morning. This, of course, means leaving Bruce alone in bed. I think it’s safe to say that Bruce would not approve of Selena’s late-night visit, especially since she broke numerous laws to accomplish it. This being the case, it appears that Selena is unwilling to change her ways just for Bruce’s love. If the two are to stay together, then that means that Bruce will have to accept being married to someone who stands against most of the things he represents as Batman. While love is indeed powerful, it’s hard to picture Bruce giving up his moral code for any person, let alone Selena. This brings me to the second reason why I think the marriage between these two can’t last. Selena is a chaotic neutral character. She follows her own individual whims (see above) and doesn’t favor doing good or bad — she just does what’s good for her. Bruce is a lawful good character who will always fight for justice and stand for what is right. These are intrinsic traits that each of these characters have had since their inception and it is because of these traits that they cannot be together. And that’s where the serialized nature of comics works to the benefit of their relationship. The courtship of Batman and Catwoman is so interesting because we all know they can never actually end up together and be happy. In their heart of hearts, I think both of these characters know it too. With comics being serialized, however, it’s okay if they never tie the knot and live happily ever after. Their relationship is always in flux — it’s what defines it. Unlike a movie or book that would require some closure, in comics their relationship can live out the “will they, won’t they” dance endlessly. And that’s more than okay. One last thing, only tangentially related to this, is the way Selena is portrayed in this issue. Just as she has always been a chaotic neutral character, Selena has always been written as a femme-fatale archetype. Sadly, this means she has been objectified throughout her life in comics and the same holds true here. When she first breaks into the bridal shop Selena throws off her wet Catwoman costume and proceeds to luxuriate on the carpet in her underwear for at least a full minute. That’s just weird and not something that any actual woman would do. Instead, it’s clear that the creators of the comic are falling into the familiar pattern of overly sexualizing Selena just because they can. This has frequently, if not always, been the case with Catwoman and it’s disappointing to see this aspect of Selena’s character still being exploited today when such infantile troupes should have vanished years ago. I mean, this issue is basically trying to excuse the fact that King has consistnetly failed to justify his garbage by pretending that the rest of Batman’s publication history has done enough. Which ignores two essential things. Firstly, that Batman’s publication history, both on a continuity level and more importantly on a meta level, don’t. THe status quo has been that irreconcilable differences have forced them to be separate, and unable to take a step closer without a good dose of character development. And the second and most important point is that, even if King did have the publication history behind him, it in no way justifies King’s failure to write Selina. Nothing anyone else writes can justify what you wrote or didn’t write. It has to be in your work. Instead, this s just more craven cowardice from King. Meanwhile, this book continues its ugly look in reality. It can’t even tell a simple story without falling flat on its faith in the most embarassing way. He can’t get one payoff to work, he can’t write a single character properly. But we do get a truly ugly vision of the world. A vision of major characters and NPCs. Where the world revolves around you and other people are just props for your story A worl where the every other person isn’t even a person because you are the only one that matters. A sickening narcissim. Comic for the Trump era, int he worst way possible.